Bee Friendly Monmouthshire was officially launched on Friday October 10th at 11a.m. at Kate Humble’s farm, Humble by Nature, in Penallt, near Monmouth. Kate Humble, well known from her appearance on Spring Watch on BBC TV, has kindly agreed to be the Patron of Bee Friendly Monmouthshire. An invitation was emailed out to all the schools who have participated in our wild flower planting project and we were very pleased that two schools were able to be present at the launch; Gilwern Primary School and Deri View Primary School. Some of the children helped Kate to plant a bee-friendly sign in her garden and after the ceremony there was time to explore the farm and look at the hens, pigs, ducks and geese and the amazing Aquaponics solar greenhouse. 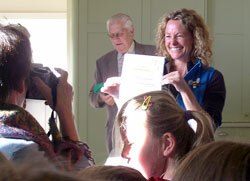 Kate Humble receiving her certificate for signing the pledge to promote pollinators. This entry was posted in Uncategorized on October 23, 2014 by BfM_admin.